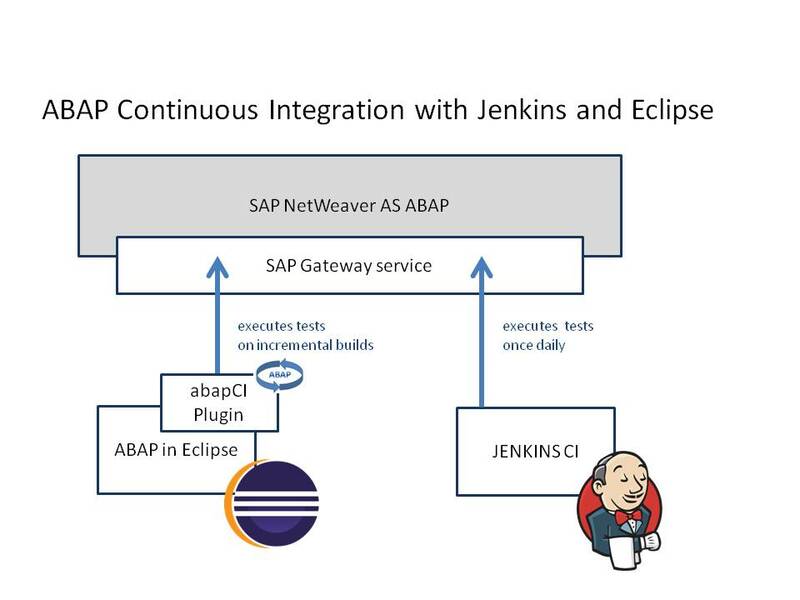 As an add-on for ABAP in Eclipse the plugin ABAP Continuous Integration contains some features for a Continuous Integration environment. The plugin can be downloaded from the Eclipse Marketplace. 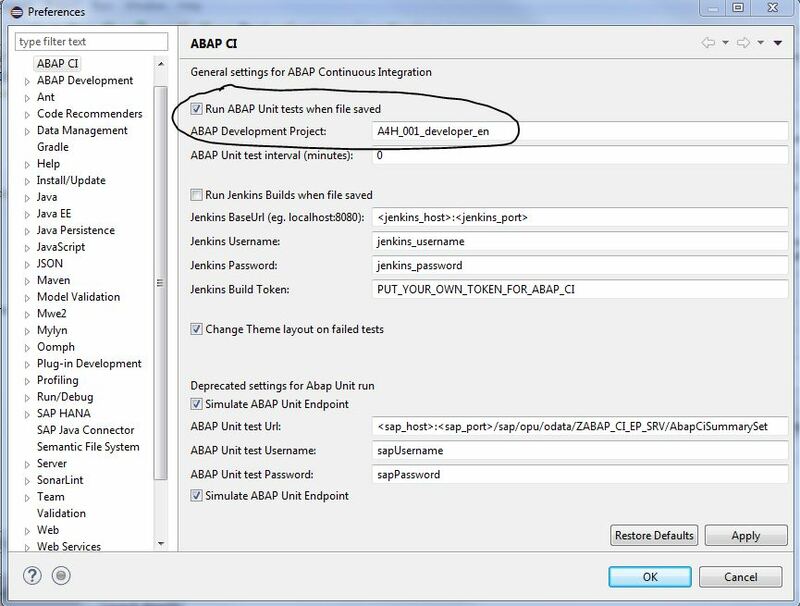 In the first textbox (ABAP Development Project) the display name of your ABAP development system has to be inserted. The display name can be found in the Eclipse Package Explorer and has the form <system>_<client>_<user>_<language>, e.g. A4H_001_developer_en. 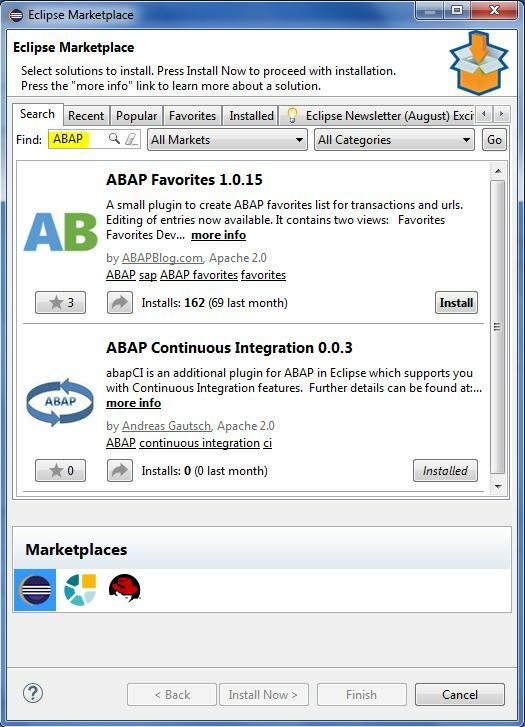 With the integration of ABAP into Eclipse a state of the art development environment is available for developing in ABAP. One thing I am still missing is a tooling for a Continous Integration (CI) environment. A daily check of all ABAP unittests can be done for example with Jenkins. But often its really valuable to get an immediate feedback when a code change is breaking a core functionality of the system. If you want to see some more details, the actual source code is available on github: abapCI. 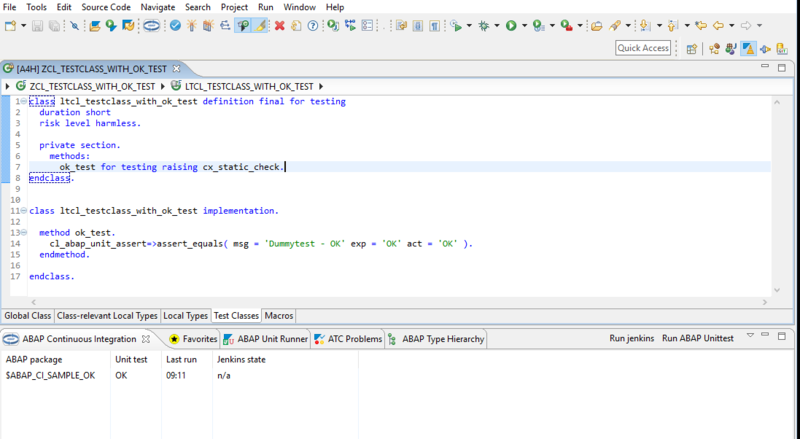 In the first textbox (ABAP Development Project) the display of your ABAP Development system has to be inserted. The display name can be found in the Eclipse Package Explorer and has the form <system>_<client>_<user>_<language>, e.g. A4H_001_developer_en. And of course ATC checks on transport release. Job based daily checks on packages and even workflow integration also exists I think? I assume the Jenkins usage is nice if you already use it for non-sap-development and therefore cannot only rely on a central ATC system. Currently the plugin does not include ATC checks but I was already thinking about them as a next feature. Lets see if I find the time or even somebody else likes to do it. Where step 2 and 4 is automatically performed each time a development object is saved (I did not yet find a possibilty to listen on the Activate event itself). Well in the case you need some details about the fail reason of the unit test, especially which unit test failed the only possibility is still the Abap Unit Runner view. But the plugin maybe saves you some time and effort when after a code change the tests turn as expected green thus you need not to manually rerun them in the Abap Unit Runner. And I absolutely agree with you too in the point of the jenkins usage. the plugin is a good help to makes the development process with ABAP Unit more efficient. 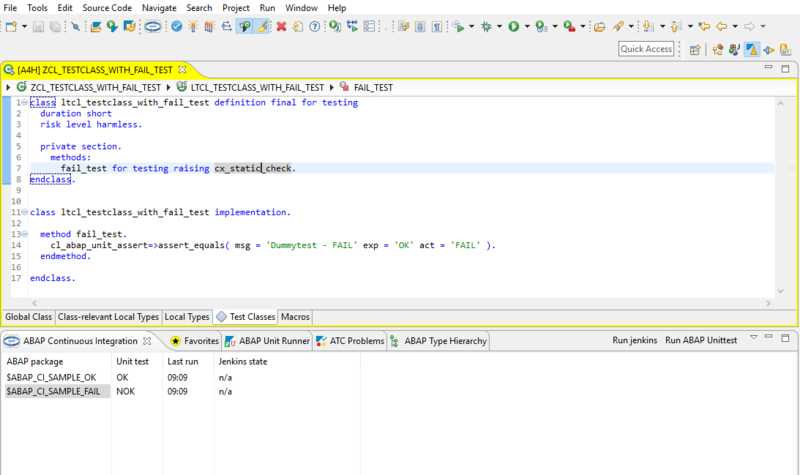 Is there also a possibilty to use the plugin with more then one ABAP Development Project? Currently its working only for one development project. I was thinking already to extend it to support DEV and QAS environment which would go into your suggested direction. But before extending the plugin to multiple systems there is some other stuff pending like cleaning up the datamodel what I definitely plan to do. Thinking more forward. How would you suggest it to work. Should the central Unit test and ATC state only visualize the state of the current project or the state of all configured development projects together? great to hear that there are already plans for the future. I often switch between different development projects. For that it would be a big improvement, when the AUnit state of the current project would be visualized. Finally the switch between different development projects should work. It helps very much if you have to switch often the development projects. great work! Just saw that there’s a option to run ATC checks after unit tests. Is this already working? Just tried it and didn’t get any results. If I start ATC manually I get results. Or am I doing something wrong? The option ATC check is already working. In the current version there are only ATC errors analyzed (ATC warnings will follow). Currently the ATC checks are only performed when the Unittest-State changes from FAIL to OK. So for example if you start eclipse and the tests turn OK the ATC checks are performed. In this first draft I sticked to this approach because as far as I know with every ATC test run an database entry written and I do not want to flood the system. The timepoint “unittest change from FAIL to OK” was selected with the intention to support an TDD mode – at the beginning of the refactor phase the ATC checks are executed. Well thats all for the beginning, ideas welcome. Problems occurred when invoking code from plug-in: “org.eclipse.ui.workbench”. Any idea what I may be missing ??? Could you please post the stacktrace of the error you get and the version of your Eclipse installation, then I will take a deeper look into the your errors. I installed the plugin and tried it. It really works well I must say. Once I activate my class, the unit tests are run immediately and I get feedback. 1. When I am working on a class, if any unit tests are broken, it would be of that class only. The units of other classes will not call the class I am modifying anyway. This would make the result very focused and execution would be faster. 2. In a project, there would be more than 1 class developed by more than 1 developer in a package. I get NOK even when the unit test written by some one else fails in another class. You are adressing a point which is indeed one of the next features which should be implemented. I have two possible implementations in mind. The one is two run the tests only for the class which is activated or to work with a functionality “local supressions”. For the pure unit tests the running of only the adapted classes would be perfect but if there are also functional tests (implemented as unit tests) this would not be sufficient. I think if I have (or somebody else has) the time for it, both approaches would be worth. I definitely planning this two features within the next I want to add. In the latest version of the ABAP CI plugin there is now an option “Run Unit tests for the activated ABAP objects only” (the second one in the ABAP CI preference section). This should hopefully exactly fit your requirement.